and the state of Indiana (right). Gary (/ɡɛəri/) is a city in Lake County, Indiana, United States, 25 miles (40 kilometres) from downtown Chicago, Illinois. 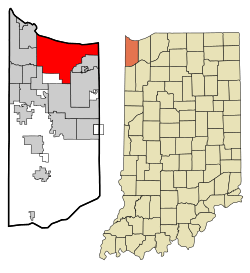 The population of Gary was 80,294 at the 2010 census, making it the ninth-largest city in the state of Indiana. From the middle of the twentieth century to the present, Gary has experienced drastic population loss, falling by 55 percent from its peak of 178,320 in 1960. Gary is adjacent to the Indiana Dunes National Lakeshore and borders Lake Michigan. The city is known for its large steel mills, and for being the birthplace of The Jackson 5 music group. Gary was the site of civil unrest in the Steel Strike of 1919. On October 4, 1919, a riot broke out on Broadway, the main north-south street through downtown Gary, between striking steel workers and strike breakers brought in from outside. Three days later, Indiana governor James P. Goodrich declared martial law. Shortly thereafter, over 4,000 federal troops under the command of Major General Leonard Wood arrived to restore order. The jobs offered by the steel industry provided Gary with very rapid growth and a diverse population within the first 26 years of its founding. According to the 1920 United States Census, 29.7% of Gary's population at the time was classified as foreign-born, mostly from eastern European countries, with another 30.8% classified as native-born with at least one foreign-born parent. 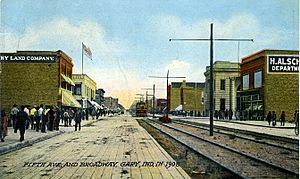 By the 1930 United States Census, the first census in which Gary's population exceeded 100,000, the city was the fifth largest in Indiana and comparable in size to South Bend, Fort Wayne, and Evansville. At that time, 19.3% of the population was classified as foreign-born, with another 25.9% as native-born with at least one foreign-born parent. Gary was also becoming increasingly racially diverse, with 17.8% of the population classified as black, and 3.5% as Mexican. U.S. Steel's Gary Works in 1973. Gary's fortunes have risen and fallen with those of the steel industry. The growth of the steel industry brought prosperity to the community. Broadway was known as a commercial center for the region. Department stores and architecturally significant movie houses were built in the downtown area and the Glen Park neighborhood. In the 1960s, like many other American urban centers reliant on one particular industry, Gary entered a spiral of decline. 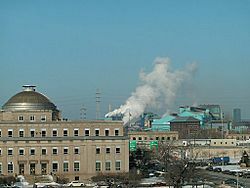 Gary's decline was brought on by the growing overseas competitiveness in the steel industry, which had caused U.S. Steel to lay off many workers from the Gary area. 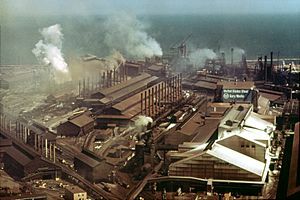 The U.S. Steel Gary Works employed over 30,000 in 1970, declined to just 6,000 by 1990, and further declined to 5,100 in August of 2015. As the city declined, crime increased. Rapid racial change occurred in Gary during the late 20th century. These population changes resulted in political change which reflected the racial demographics of Gary: the non-white share of the city's population increased from 21% in 1930, 39% in 1960, to 53% in 1970. Non-whites were primarily restricted to live in the Midtown section just south of downtown (per the 1950 Census, 97% of the black population of Gary was living in this neighborhood). Gary had one of the nation's first African-American mayors, Richard G. Hatcher, and hosted the ground-breaking 1972 National Black Political Convention. Since the 1930s, Gary had developed a reputation as a tough city due to rampant political corruption, racial violence & segregation, labor unrest, and industrial pollution. In the 1960s through the 1980s, surrounding suburban localities such as Merrillville and Crown Point experienced rapid growth, including new homes and shopping districts. Owing to white flight, economic distress, and a perception of skyrocketing crime, many middle-class and affluent residents moved to other cities in the metro area. In the late 1990s and early 2000s, Gary had the highest percentage of African-Americans of U.S. cities with a population of 100,000 or more, 84% (as of the 2000 U.S. census). This no longer applies to Gary since the population of the city has now fallen well below 100,000 residents. As of 2013, the Gary Department of Redevelopment has estimated that one-third of all homes in the city are unoccupied and/or abandoned. U.S. Steel continues to be a major steel producer, but with only a fraction of its former level of employment. While Gary has failed to reestablish a manufacturing base since its population peak, two casinos opened along the Gary lakeshore in the 1990s, although this has been aggravated by the state closing of Cline Avenue, an important access to the area. Today, Gary faces the difficulties of a rust belt city, including unemployment, decaying infrastructure, and low literacy and educational attainment levels. Gary has closed several of its schools within the last ten years. While some of the school buildings have been reused, most remain unused since their closing. As of 2014, Gary is considering closing additional schools in response to budget deficits. Three-term Democratic mayor Scott King resigned from office in March 2006, citing a desire to return to private law practice. Then-deputy mayor and former Calumet Township trustee Dozier T. Allen Jr., became acting mayor pending a formal election by local Democratic party officials. On April 4, 2006, local officials chose former Lake County commissioner and King rival Rudolph Clay to fill the remaining 21 months of King's term. Gary chief of police Thomas Houston was convicted of excessive force and abuse of authority in 2008; he died in 2010 while serving a three-year, five-month federal prison sentence. In April 2011, 75-year-old mayor Rudy Clay announced that he would be suspending his campaign for reelection owing to ongoing treatments for prostate cancer. After exiting from the race, Clay endorsed rival Karen Freeman-Wilson, who won the Democratic mayoral primary in May. Freeman-Wilson won election with 87 percent of the vote and her term began in January 2012; she is the first woman elected mayor in the city's history. Lake County, Indiana Superior Court Building. Downtown Gary is separated by Broadway into two separate communities. Originally, the City of Gary consisted of The East Side, The West Side, The South Side (the area south of the train tracks near 9th Avenue) and Glen Park, located further South along Broadway. The East Side was demarcated by streets named after the States in order of their acceptance into the Union. This area mostly contained wood-frame houses, some of the earliest houses and was known for its ethnic populations from Europe and large families. It was a beautiful area of single-family houses with repeating house designs alternating from one street to another, some streets looking very similar. Several of the East Side's most notable buildings were Memorial Auditorium (a large red-brick and stone civic auditorium and the site of numerous events, concerts and graduations) The Palace Theater, Emerson School, St. Luke's Church, H.C. Gordon & Sons and Goldblatt's Department Stores, in addition to the Fair Department Store all fronting Broadway at the main street that divided Gary, much like State Street and Madison Streets divides Chicago's North, South, West and East Sides. Lytton's, Hudson's ladies store, J.C. Penney and Radigan Bros Furniture Store were on the west side of Broadway. The West Side of Gary or West of Broadway, the principal commercial street, had streets named after the presidents of the United States in order of their election. This side of town was known for its masonry or brick residences, its taller and larger commercial buildings, including the Gary National Bank Building, Hotel Gary (now Genesis Towers), The Knights of Columbus Hotel & Building (now a seniors building fronting 5th Avenue), the Tivoli Theater (demolished), the U.S. Post Office, Main Library, Mercy and Methodist Hospitals and Holy Angels Cathedral and School. The West Side also had a secondary principal street, Fifth Avenue which was lined with many commercial businesses, restaurants, theaters, tall buildings and elegant apartment buildings. The West Side was viewed as more exclusive, with residences dating from about 1908 to the 1930s. Many of the West Side's housing were for executives of U.S. Steel and prominent businessmen, with several examples being 413 Tyler Street and 636 Lincoln Street. Many of the houses were on larger lots, with more substantial residences and mansions located in some areas of the West Side. There were also unique row houses made of poured concrete which were ganged together and known as "Mill Houses", as they were built to house steel mill workers. The areas known as Emerson and Downtown West combine to form Downtown Gary. It was developed in the 1920s and houses several pieces of impressive architecture, including one (disputed) structure, the Moe House, designed by Frank Lloyd Wright, and another, the Wynant House (1917), which was destroyed by fire. A significant number of older structures have been demolished in recent years, but a number of abandoned buildings remain in the downtown area, including historic structures like Union Station and City Methodist Church. A large area of the downtown neighborhood (including City Methodist) was devastated by fire on October 12, 1997. Interstate 90 divides downtown Gary from the United States Steel plant. Ambridge Mann is located on Gary's near west side along 5th Avenue. Ambridge was developed for workers at the nearby steel plant in the 1910s and 1920s and is named after the American Bridge Works, which was a subsidiary of U.S. Steel. The neighborhood is home to a huge stock of prairie-style and art deco homes. The Gary Masonic Temple is located in the neighborhood along with the Ambassador apartment building. Located just south of Interstate 90, the neighborhood can be seen while passing Buchanan Street. Brunswick is located on Gary's far west side. The neighborhood is located just south of Interstate 90 and can be seen from the expressway. The Brunswick area includes the Tri-City Plaza shopping center on West 5th Avenue (U.S. 20). The area is south of the Gary Chicago International Airport. Downtown West is located in north-central Gary on the west side of Broadway just south of Interstate 90. The Genesis Convention Center, the Gary Police Department, the Lake Superior Court House, and the Main Branch of the Gary Public Library are located along 5th Avenue. A new 123-unit mixed-income apartment development was built using a HUD Hope VI grant in 2006. The Adam Benjamin Metro Center is located just north of 4th Avenue. It is operated by the Gary Public Transportation Corporation and acts as a multimodal hub. It serves as the Downtown Gary South Shore train station and an intercity bus stop. Tolleston is one of Gary's oldest neighborhoods, predating much of the rest of the city. It was plated out by George Tolle in 1857, when the railroads came to the area. The area is to the west of Midtown and south of Ambridge Mann. Tarrytown is a subdivision located in Tolleston between Whitcomb Street and Clark Road. Black Oak is located on the far southwest side of Gary, in the vicinity of the Burr Street exit to the Borman Expressway. It was annexed in the 1970s. Prior to that, Black Oak was an unincorporated area informally associated with Hammond, and the area has Hammond telephone numbers. The community was convinced (after three previously failed attempts) by Mayor Hatcher that its residents would benefit more from services provided by the city than from those provided by the county. It is the only majority-white neighborhood in Gary. Glen Park is located on Gary's far south side and is made up mostly of mid-twentieth-century houses. Glen Park is divided from the remainder of the city by the Borman Expressway. The northern portion of Glen Park is home to Gary's Gleason Park Golf Course and the campus of Indiana University Northwest. The far western portion of Glen Park is home to the Village Shopping Center. Glen Park includes the 37th Avenue corridor at Broadway. Midtown is located to the south of Downtown Gary, along Broadway. This was, traditionally, the original "black" neighborhood in the pre-1960s days of segregation. Aetna is located on Gary's far east side along the Dunes Highway. Aetna predates the city of Gary. It was a company town founded in 1881 by the Aetna Powder Works, an explosives company that closed with the end of World War I. The Town of Aetna was annexed in 1928 around the same time Gary annexed the Town of Miller. A building boom happened shortly afterward in the late 1920s and early 1930s, making Aetna home to an impressive collection of art deco architecture. The rest of the community was built throughout the 1950s after the Korean War in a series of phases. On its south and east, Aetna borders the undeveloped floodplain of the Little Calumet River. Emerson is located in north-central Gary on the east side of Broadway. Located just south of Interstate 90. Gary City Hall is located in Emerson along with the Indiana Department of Social Services building and the Calumet Township Trustee's office. A 6,000-seat minor league baseball stadium for the Gary SouthShore RailCats, U.S. Steel Yard, was constructed in 2002, along with contiguous commercial space and minor residential development. Miller Beach, also known through the years as Miller Station or just simply as Miller, is on Gary's far east side. Incorporated as an independent town in 1907, Miller was annexed by the city of Gary in 1918. Miller developed around the old stagecoach stop and train station known, as early as the 1840s, as Miller's Junction. The Miller Beach area has remained somewhat separated from the rest of Gary both culturally and geographically. Miller Beach continues to be racially and economically diverse, and attracts investor interest due to the many year-round and summer homes within walking distance of Marquette Park and Lake Michigan. Prices for lakefront property are affordable compared with Illinois suburban communities. Lake Street provides shopping and dining options for Miller Beach visitors and residents. East Edge, a development of 28 upscale condominium, townhome, and single-family homes, began construction in 2007 at the eastern edge of Miller Beach along County Line Road, one block south of Lake Michigan. Lake County Superior Court House and US Steel Gary Works. The city sits on the southern end of the former lake bed of the prehistoric Lake Chicago, and also the current Lake Michigan. Most of the city's soil nearly one foot below the surface is pure sand. The sand beneath Gary, and on its beaches, is of such high quality that in years past it was mined for the manufacture of glass. According to the 2010 census, Gary has a total area of 57.18 square miles (148.10 km2), of which 49.87 square miles (129.16 km2) (or 87.22%) is land and 7.31 square miles (18.93 km2) (or 12.78%) is water. Gary is "T" shaped, with its northern border on Lake Michigan. At the Northwesternmost section Gary borders Hammond and East Chicago. Miller Beach, its easternmost neighborhood, borders Lake Station and Portage. Gary's southernmost section borders Griffith, Hobart, Merrillville, and unincorporated Ross. from the Chicago Loop. Gary is listed by the Köppen-Geiger climate classification system as humid continental (Dfa). In July and August, the warmest months, high temperatures average 84 °F (29 °C) and peak just above 100 °F (38 °C), and low temperatures average 63 °F (17 °C). In January and February, the coldest months, high temperatures average around 29 °F (−2 °C) and low temperatures average 13 °F (−11 °C), with at least a few days of temperatures dipping below 0 °F (−18 °C). The weather of Gary is greatly regulated by its proximity to Lake Michigan, as it sits at the lake's southernmost point. Weather varies yearly. In summer months Gary is humid. The city's yearly precipitation averages about 40 inches. Summer is the rainiest season. Winters vary but are predominantly snowy. Snowfall in Gary averages approximately 25 inches per year. Sometimes large blizzards hit because of "lake effect snow", a phenomenon whereby large amounts of water evaporated from the lake deposit onto the shoreline areas as inordinate amounts of snow. As of the census of 2010, there were 80,294 people, 31,380 households, and 19,691 families residing in the city. The population density was 1,610.1 inhabitants per square mile (621.7/km2). There were 39,531 housing units at an average density of 792.7 per square mile (306.1/km2). The racial makeup of the city was 84.8% African American, 10.7% White, 0.3% Native American, 0.2% Asian, 1.8% from other races, and 2.1% from two or more races. Hispanic or Latino of any race were 5.1% of the population. Non-Hispanic Whites were 8.9% of the population in 2010, down from 39.1% in 1970. There were 31,380 households of which 33.5% had children under the age of 18 living with them, 25.2% were married couples living together, 30.9% had a female householder with no husband present, 6.7% had a male householder with no wife present, and 37.2% were non-families. 32.8% of all households were made up of individuals and 11.9% had someone living alone who was 65 years of age or older. The average household size was 2.54 and the average family size was 3.23. The median age in the city was 36.7 years. 28.1% of residents were under the age of 18; 8.6% were between the ages of 18 and 24; 21.8% were from 25 to 44; 27.1% were from 45 to 64; and 14.5% were 65 years of age or older. The gender makeup of the city was 46.0% male and 54.0% female. As of the census of 2000, there were 102,746 people, 38,244 households, and 25,623 families residing in the city. The population density was 2,045.5 people per square mile (789.8/km²). There were 43,630 housing units at an average density of 868.6 per square mile (335.4/km²). The racial makeup of the city was 84.03% African American, 11.92% White, 0.21% Native American, 0.14% Asian, 0.02% Pacific Islander, 1.97% from other races, and 1.71% from two or more races. Hispanic or Latino of any race were 4.93% of the population. There were 38,244 households out of which 31.2% had children under the age of 18 living with them, 30.2% were married couples living together, 30.9% had a female householder with no husband present, and 33.0% were non-families. 28.9% of all households were made up of individuals and 9.4% had someone living alone who was 65 years of age or older. The average household size was 2.66 and the average family size was 3.28. In the city, the population was spread out with 29.9% under the age of 18, 10.1% from 18 to 24, 25.1% from 25 to 44, 22.2% from 45 to 64, and 12.8% who were 65 years of age or older. The median age was 34 years. For every 100 females there were 84.6 males. For every 100 females age 18 and over, there were 78.0 males. The median income for a household in the city was $27,195, and the median income for a family was $32,205. Males had a median income of $34,992 versus $24,432 for females. The per capita income for the city was $14,383. About 22.2% of families and 25.8% of the population were below the poverty line, including 37.9% of those under age 18 and 14.1% of those age 65 or over. A Nightmare on Elm Street being filmed in Gary. The 1996 urban movie Original Gangstas was filmed in the city. The movie starred Gary native Fred Williamson, Pam Grier, Jim Brown, Richard Roundtree, and Isabel Sanford, among others. Since the early 2000s, Gary has experienced a surge of Hollywood filmmakers wishing to shoot movies in the city. 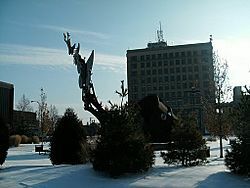 In 2009, scenes for the remake of A Nightmare on Elm Street were filmed in Gary. 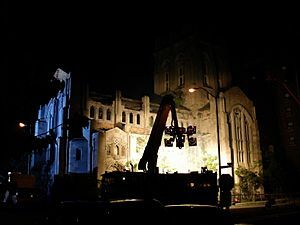 Scenes from Transformers: Dark of the Moon wrapped up filming on August 16, 2010. The History Channel documentary Life After People was filmed in run-down and derelict parts of Gary, Indiana. Meredith Willson's 1957 Broadway musical The Music Man featured the song "Gary, Indiana", in which lead character (and con man) Professor Harold Hill wistfully recalls his alleged hometown. 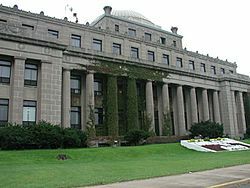 In the play, Hill claims to be an alumnus of "Gary Conservatory of Music, Class of '05," but his entire reference to Gary is later revealed to be another of his lies, as the City of Gary was not founded until 1906. Willson's musical, set in 1912, later was the basis of a film (1962) and a television film (2003). The Gary SouthShore RailCats are an American Association, professional baseball team. 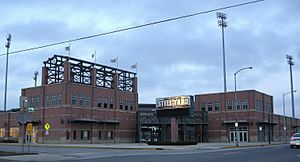 The team plays in Gary's U.S. Steel Yard baseball stadium. The RailCats played in the Northern League from 2002 until 2010 and now play in the modern American Association. The team won league championships in 2005, 2007, and 2013. The Gary Splash are an International Basketball League, professional basketball team. The team plays at the Genesis Convention Center. Formerly, the Gary Steelheads played in the Genesis Convention Center as part of the IBL, CBA, USBL, and IBL. Historical photo of the Gary Fire Department in 1914. Michael Jackson's childhood home in Gary, Indiana, shortly after the singer's death in 2009. Frank Borman, former astronaut for NASA and a retired United States Air Force Colonel. Gary, Indiana Facts for Kids. Kiddle Encyclopedia.